A Catholic nun from Britain who has spent 29 years caring for leprosy patients in Bengaluru, India, is being forced to give up her work and leave the country after Delhi refused to renew her residency permit. London-born Jacqueline Jean McEwan, now known as Sister Jean, or the Mother Teresa of Sumanahalli, runs a mobile clinic for leprosy patients. She has been ordered to leave without explanation by the union home ministry and if her appeal for permission to stay goes unanswered by 2pm on Monday she will have to board an evening flight bound for London. “It’s in God’s hands,” said the 63-year-old nun, who spent her early years in Newcastle but has been working at the centre, run by the Sumanahalli Society, since 1982. The rest on this deportation here. UPDATE: Good news. 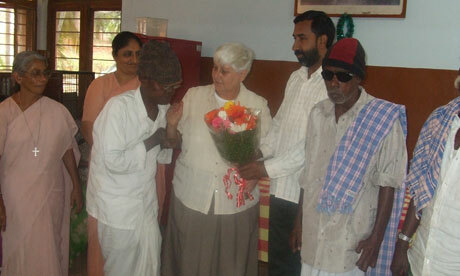 India assures a long stay for British nun working with leprosy victims! The Huffington Post also reports on his remarks here. Anders Behring Breivik (32) Prior to the attacks, published a long manifesto and a video on the Internet, where he describes the attacks he was about to perform. It is about more than twelve minutes long video, which Behring Brevik compare themselves with Knights, and encourage a year-long war against Marxism and Islamism. He has also published a manuscript of 1,500 pages which he explains very extreme political views. In addition, he describes in detail how an attack to be carried out. Everything from the use of the car bomb of the type of equipment to be used in an attack. On an image that has not previously been known pose the seemingly Anders Behring Breivik in a diving suit with what looks like an automatic rifle. In the document, which is over 1500 pages the author elaborates on events throughout history and will repeatedly return to the Knights Templar, or Knights Templar as they say in English. 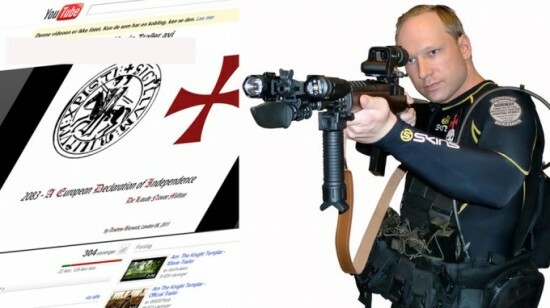 Today, the Knights Templar, an order within the Masonic movement, which also Anders Behring Breivik was a member of. He will now be excluded from the Masonic Order. The above was (HT) here. Bishop Fabio Duque Jaramillo of Armenia, Colombia has denounced the actions of a man who destroyed the chapel at the San Marcelino Parish Center for Evangelization, stole several chalices, and trampled on consecrated hosts. The alleged perpetrator was taken into custody by police and is awaiting charges. The director of communications for the Diocese of Armenia, Father Juan Carlos Rodas, told EWTN News that an act reparation will take place on July 23 at the chapel. “We will consecrate the new tabernacle, which will replace the one that was destroyed. We have received permission to reserve the Eucharist again there for adoration and communion for the sick in our community,” he said. Fr. Rodas also said the act of reparation will include prayers “for the repentance of the person who committed this abominable act and for forgiveness for the faults committed against the Lord’s presence” in the Eucharist. Bishop Duque Jaramillo said police recovered a number of the items that were stolen. “No Christian can remain indifferent. The theft committed at the San Marcelino Parish Center for Evangelization was a profanation of the Eucharist, a sacrilege that is troubling and hurtful,” he said in a statement. “The Body of Christ thrown to the ground like a worthless object is a tragic image of a society that puts material goods above the one true good, which is Christ. It reminds us of that day when men scorned, trampled and killed the God who became man out of love,” he added. Bishop Duque Jaramillo noted that in accord with the Church’s norms, the chapel has remained closed until the day of the act of reparation, and that the person who committed the sacrilege has incurred automatic excommunication. People deprived of the internet feel ‘upset and lonely’ and find going offline as hard as quitting smoking or drinking. Wow! Sure the internet is a great place – and I really enjoy blogging – but if this is the case, then it’s a serious problem! A new study has revealed that 53 per cent feel upset when denied access and 40 per cent feel lonely if they are unable to go online. The research found that people experience these feelings even if denied online access for a short time. The study was carried out by consumer research firm Intersperience, who surveyed over 1,000 people. Participants were quizzed on their attitudes to the use of the internet, smart phones, and other devices, and were even asked to go 24 hours without any access to internet technology. Giving up all technology allowing web access was described by some participants as similar to quitting drinking or smoking.